(Bloomberg Businessweek) -- In Bengaluru’s busy Madiwala neighborhood, a Poorvika Mobile World shop is plastered with posters for Samsung and Xiaomi and filled with inexpensive phones from brands like China’s Oppo and Vivo. Off to one side is a forlorn display stand with the iPhone 6, 6s, and X, the latter sitting upside down. Despite a zero-interest payment plan and cash-back incentives, Apple Inc. is lucky if the iPhones account for 25 of the 1,000 smartphones the store sells each month, says manager Nagaraja B.C., who goes by one name. “The average budget of a shopper is about 10,000 rupees,” he says, roughly $150. The iPhone SE, the cheapest Apple model, costs almost twice that. For $100, shoppers can get a Xiaomi Redmi 5A with a bigger battery, better camera, and greater storage capacity. Lost in the hoopla around Apple’s $1 trillion capitalization has been its serious trouble in the world’s second-largest smartphone market, where it ranks 11th. 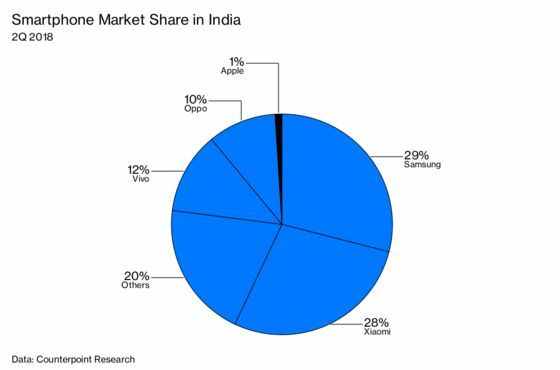 The company accounts for 1 percent of India’s phone sales and sold fewer than 1 million phones there during the first half of 2018, according to Counterpoint Research, while Xiaomi sold more than 19 million. During a weeklong trip to India two years ago, Apple Chief Executive Officer Tim Cook told just about every employee, politician, and Bollywood star he saw that the country was central to his plans. During a July 31 earnings call, he barely mentioned it. Behind the scenes, though, he’s been working to remold Apple’s failing India strategy, according to current and former Apple employees. “They’ve largely failed in India, despite comments from the company that they will see more progress,” says Gene Munster, the co-founder of Loup Ventures. “I suspect we’re three years away from Apple highlighting major growth in India.” Apple declined to comment for this story. At $1,500, including a 20 percent import tax, the iPhone X is a tough sell in a country where many people still can’t afford a smartphone of any kind. Fewer than 5 percent of phones purchased in India sell for more than $450, according to Counterpoint. Even the lesser iPhone 8 costs about $900, so Apple has fallen back on selling older models—the iPhone 6, 6s, and SE. That worked well from 2014-17, but sales slowed sharply this year. In part, that’s because the cheaper hardware is now more than 2 years old, ancient by smartphone standards. Because the government has made it tough for Apple to open its own retail stores in India, iPhone prices are less reliable than the company’s reputation for strict price controls would suggest. Indian wholesalers and online retailers often raise or lower their prices daily without giving a reason, leading shoppers to haggle or wait in hopes of a better deal, says Subhash Chandra, who runs a 510-store chain of gadget shops called Sangeetha Mobiles. Two leading retail chains say iPhone sales have fallen to one-third of their January level. Instead of officially lowering its prices, Apple is in talks with retailers and banks to offer holiday deals all year round, according to people familiar with the plans. Those people say Apple is also asking some individual stores to more than quadruple sales targets, to 40 or 50 iPhones a week, and plans to cut off retailers that consistently fail to hit the mark. Retail sales staff will be trained to teach customers how to use their devices, and Apple intends to overhaul in-store branding and product displays. Executives would conduct daily conference calls with stores to gauge progress. Apple hopes to start opening stores in India next year and eventually set up three in New Delhi, Bengaluru (formerly known as Bangalore), and Mumbai, according to the people familiar with the company’s plans. The government has long required foreign companies opening shops to manufacture 30 percent of their products locally, but it said in January that businesses can reduce that requirement by sourcing more Indian goods for their global operations. Apple now builds some of its India-aimed iPhone SE and 6s models in Bengaluru; it’s unclear whether the company plans to take advantage of the revised policy or try to hit the 30 percent mark. None of this will make much difference if Apple doesn’t understand its customers. For years, Indian consumers have complained that Siri can’t process their requests in local languages, they have no access to Apple Pay, and Apple Maps can’t give them turn-by-turn directions or identify points of interest. The 2020 revamp is supposed to fix Maps’ failings, say the people familiar with Apple’s plans, but so far, the Maps development office the company set up in Hyderabad in 2016 has mostly been used for editing map data in other parts of the world. For now, Google dominates the maps market, and along with Facebook controls much of the developer community. Google’s and Amazon.com’s voice assistants are far ahead of Siri when it comes to understanding Indian languages and accents.